"Thank so much for the fast service. 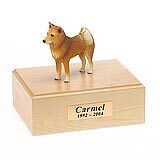 The urn is absolutely beautiful. It means so much to us and we could never have gotten anything more perfect. " 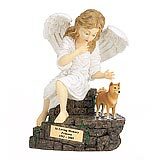 All available Finnish Spitz dog urns and memorials will be displayed with the figurine on the Finnish Spitz urn you select and in the appropriate size.